Cocktail Hacker » Blog Archive » Pisco Sour – Cold. Frothy. Delicious. 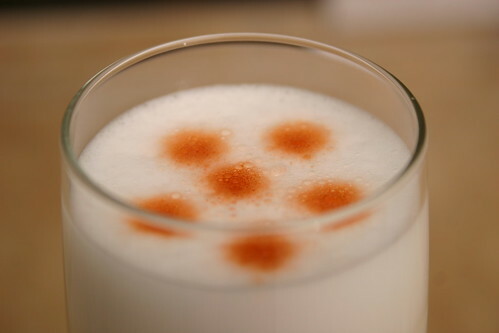 Pisco Sour – Cold. Frothy. Delicious. To use the parlance of the time I came in to the Pisco Sour as a total newb. I’d never had one, never actually seen one in person and never even tasted Pisco. But I was ready and willing to learn. That willingness led me to what seemed like the logical beginning, learning about Pisco itself. There is a ton out there to read, but I’ll give the brief high level view. Pisco is a non wood-aged form of Brandy local to both Peru and Chile. There are four basic types Puro, Aromatic, Mosto Verde and Acholado, of which you’ll primarily see Puro and Acholado in the US. Pisco Puro is composed of a single variety of grape, usually the Quebranta and tends to be drier than Pisco Acholado. Acholado is composed of a mixture of two or more grape varieties. I was only able to track down two bottles of Pisco at my local liquor store, Don Cesar Pisco Puro and Montesierpe Pisco Acholado. Both were very good but I found myself using the Acholado more as it had a more complex flavor and was a touch sweeter. So, beyond the differing grape varietals the primary difference between Pisco and Brandy is that Pisco is typically not wood-aged. Peruvian Pisco is aged for a short time (at least 3 months) in a non-reactive vessel (eg glass, steel, etc). This results in a spirit that is much more about the grapes themselves than the wood the spirit is aged in. As Matt echoed in his comment on my intro post, I can’t see myself sipping a glass of straight Pisco in the same way I would Brandy or Cognac. Although, in a cocktail this spirit really is very tasty. Speaking of cocktails, let’s talk Pisco Sour. Like I did last week I’m going to discuss the components of the drink individually and then give my favorite recipe. I’d suggest starting with an Acholado. The increased breadth of grape flavor and slight additional sweetness both work very well in this drink. However, if Pisco Puro is all you can find then certainly get that. I enjoyed both this week. You’ll find recipes for this drink calling for both lime juice and lemon juice. It seems that the citrus used in Peru most closely resemble the flavor of a key lime, which, if you haven’t had one, is a flavor akin to a cross between lemon and lime juice. I tried both lemon and lime juice (both fresh) this week and liked both, but I prefer lime juice. It has a slightly more complex flavor and I think “feels” more South American to me for some reason. Like the Whiskey Sour I profiled a few months back this drink is much better with the addition of an egg white. However, unlike the Whiskey Sour, I think this drink requires an egg white to be correct. Since the bitters are suspended on the top of the egg white foam rather than mixed in to the drink you simply can’t get that effect without them. Use fresh eggs so as to avoid possible fridge smells and produce better foam. Some recipes call for half an egg white. I would think that’s all you really need but I’ve been using a full white as it’s easier to measure and produces a lot of nice foam. The true bitters to use for this cocktail are Amargo bitters from Peru. However, since I don’t have any and Peru is a bit of a long drive, I had to use bitters I have on hand. Most modern recipes will call for the use of Angostura bitters as they’re very common and most home bars have a bottle lurking somewhere. I don’t find the aroma of Angostura bitters to be hugely pleasing though. It’s not that the aroma is bad, more that it isn’t very powerful. So, I branched out. I found that three drops each of Fee Brother’s Old Fashioned Bitters and Angostura Orange Bitters make for a nice orangy-cinnamon aroma that I find works very well in this application. I’d say stick with standard simple syrup for this drink. A couple recipes I found called for rich syrup, but I found that made a cocktail that was too sweet for my palate. The general rule of thumb is that cocktails with egg whites should be shaken dry (no ice) first for about 10 seconds, then shaken normally for another 30-60 seconds. This method works very well, but there is a drawback that I don’t like. When you shake dry you’re increasing the temperature of the ingredients slightly due to friction. When your shaker contents, specifically the gases, warm up they expand. This expansion can cause your shaker to pop open and leave you with at best a sticky shaker. Thus, I steer clear of this method if at all possible. Instead I vigorously shake the drink with ice for at least 30 seconds, 60 if my arm can stand it. This gives a very nice foam and doesn’t leave me or my kitchen sticky. Finally your drink is ready to serve, but what vessel do you go with. Gary Regan suggests a champagne flute and I agree with him. The champagne flute concentrates the sprinkling of bitters into a smaller area directly under your nose. That way you get the maximum effect of the bitters with each sip. Okay, so I’ve ranted for quite a while now, let me wrap this up with the recipe that I like the best. It’s a modification of Stevi Deter’s recipe from her blog, Two at the Most. The only changes I make are to decrease the simple syrup a bit and bump up the lime juice to make the drink a touch less sweet. Nice post, Reese. I wouldn’t have thought to use a champagne flute! There used to be a product called frothy which gave drinks their “frothy head”… do they still make it? I’ve seen something like that in one of the local liquor stores. If I remember I’ll pick some up next time I’m there and let you know my thoughts. Call me psychic though, but I’d say natural egg white is going to be better. It adds a really incredible mouth feel that I don’t think you could get from a chemical foamer. Pam – I’m in CO. I found a bottle of Collins Foamer at a local liquor store over the weekend and plan to put it to the test later this week. Stay tuned for the results. thanks. keep me posted my husband is on a mission to locate some! Pam -> I found some and tested it out. Worked pretty well actually. If your husband can’t find any drop me an email (reese at cocktailhacker.com) and I’ll get a bottle and ship it to you. thanks Reese, we found some and are waiting for it to arrive, we will test it out next weekend at our party. Pisco is mainly exported from Elqui, on the Mid center part of Chile. From a nice valley where you have sunny days almost 90% of the year, you can havee the most clear skies on earth. This valley also worked as birth place for Gabriela MIstral, a chilean writer who won the nobel prize. Pisco can also be mixed with Coca Cola, making a nice and sweet drink. The lemon is a key factor on this drink. We use one called “limon de Pica” because of the origin of those lemons, Pica an oasis in the middle of the desert in Chile. Is a very rounded lemon a bit bitter but very strong. It provides a very nice taste to the drink. Thank you Reese for your recipe. Thanks for the info, Alejandro. I’ll have to check out Chilean Pisco if I can get my hands on some! There is a product which is probably more readily available than Foamer which you might want to try: Just Whites, which is powdered egg whites which I keep on hand in case I don’t have enough egg whites for an angel food cake or meringue. I have not tried it in drinks (don’t drink much), but would be curious if someone else does and has an opinion. Sorry people but Pisco Sour need lemon juice not lime juice! Its a SOUR drink. The best recipe its so easy 3,2,1 3oz Pizco, 2oz lemon juice, 1oz syrup. If u font like to “dry” more syrup n thats all! If u want creamy put a lot of ice n blended! Not like a daikiry, almodt that!